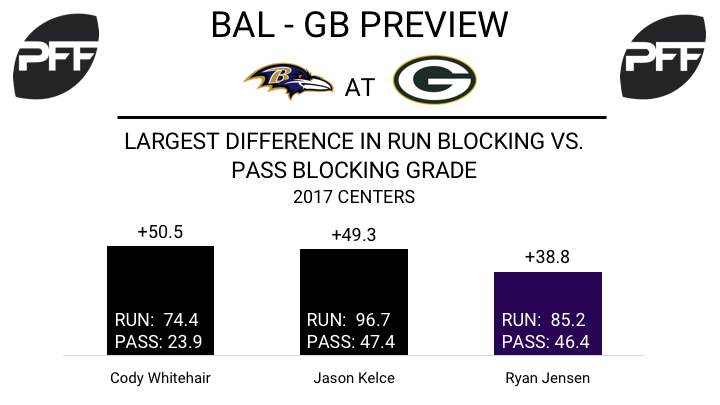 The Baltimore Ravens visit the Green Bay Packers in Week 11 of the 2017 NFL season. PFF previews the top player matchups of the game. WR Jeremy Maclin vs. CB Damarious Randall – The Ravens could look to take advantage of this potential mismatch in the slot, as Maclin takes on the seventh-lowest graded coverage cornerback this season in Randall (39.8 coverage grade). Maclin has averaged a solid 1.77 yards per route run from the slot this season, 16th-best among 54 wide receivers with at least 70 slot routes run. Just looking at his last two games, however (Weeks 8 and 9), Maclin’s yards per route run from the slot jumps to fourth-highest at 2.47. C Ryan Jensen vs. DI Mike Daniels – The phase to watch in this matchup will be in the running game. Jensen’s run-blocking grade of 85.2 ranks fourth-best among centers, though Daniels presents a tough matchup. He has a run-stop percentage of 9.5 percent, and is coming off his second-highest graded game of the season where he recorded three run stops on just 12 run-defense snaps, the second-highest run-stop percentage among all interior defenders for Week 10. T Austin Howard vs. Edge Clay Matthews – Howard has struggled in pass protection this season, though Matthews surprisingly hasn’t been as effective rushing the passer this season. Matthews’ pass-rush grade of 74.2 ranks middle of the pack among all edge defenders, and he has accumulated just 20 pressures in 245 pass-rush snaps. His pressure rate of 8.2 percent ranks sixth worst among edge defenders with at least 185 pass snaps played. Howard will look to turn things around after grading below average in each of his last four games. He will look to build on his Week 9 performance where he allowed just one pressure (a hurry). T David Bakhtiari vs. Edge Terrell Suggs – Bakhtiari is PFF’s top-ranked tackle with an overall grade of 87.6. He’s allowed three total pressures this year and has a run-blocking grade of 82.4. Suggs ranks 14th among 3-4 outside linebackers with a pass-rushing productivity of 10.8. In addition, he’s made 10 stops against the run and has a run-defense grade of 86.5. RB Jamaal Williams vs. LB C.J. Mosley – With running back Aaron Jones out and Ty Montgomery dealing with a rib injury, Williams is in line to potentially receive a heavy workload against the Ravens. Williams forced seven missed tackles on 20 rushing attempts against the Bears last week. His elusive rating of 88.3 in the matchup ranked 11th among running backs in Week 10. Despite ranking seventh among linebackers with a run-stop percentage of 10.3, Mosley hasn’t graded well against the run. He has a run-defense grade of 45.6, which is good for 58th at his position. 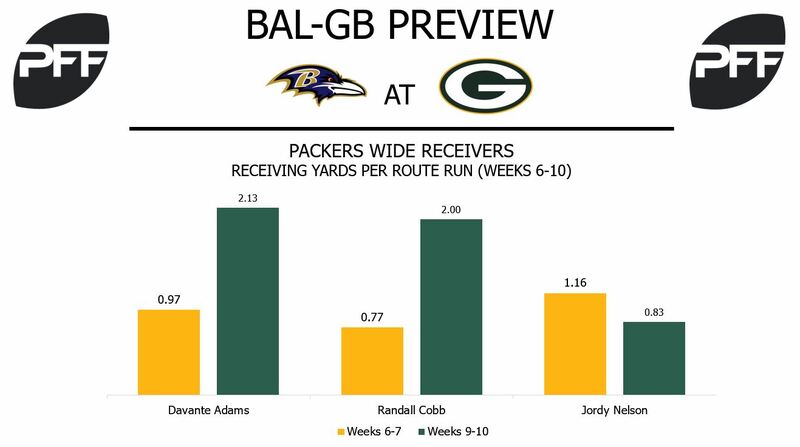 WR Randall Cobb vs. CB Lardarius Webb – Since returning from the Week 8 bye, Packers quarterback Brett Hundley has recorded a 117.6 passer rating when targeting Cobb. Over the past two weeks, Cobb has averaged 2.00 receiving yards per route run, which is tied for the 24th-best rate among receivers during that span. He’s averaging 7.1 yards after the catch per reception this season, which is the seventh-best rate for his position. Cobb has run 78.5 percent of his routes from the slot, where he’s snagged 23 catches for 240 yards and a touchdown. Webb has been Baltimore’s primary slot coverage corner this season. He’s allowed 2.21 receiving yards per slot coverage snap this season, which is the fifth-highest rate among cornerbacks. Quarterbacks have averaged an 84.2 passer rating when throwing to a player in Webb’s slot coverage.